Although it is over two weeks into the month of December, only now may one finally say that winter has truly arrived. Today is December 15, 2013, and up until now it's either been really cold and not snowing, or just below freezing and snowing. The immense snow storm that rolled in from the Southwest a few days ago marked the first time this season that snow coincided with decidedly colder temperatures. As I walk under a dense stand of pine trees at Fenner Nature Center, I am awed by the beauty of the untouched blanket of white powder that covers every available surface, from the ground I tread on to the tops of the trees. I can't help but think how lucky I am to live in a place where I can be part of scenes such as this. Suddenly, a chorus of barely audible, high-pitched trills off to my right sets my thoughts on another, altogether more marvelous course. How can these treble voices be part of this winter landscape, covered in seven inches of snow and nightly reaching subzero temperatures? 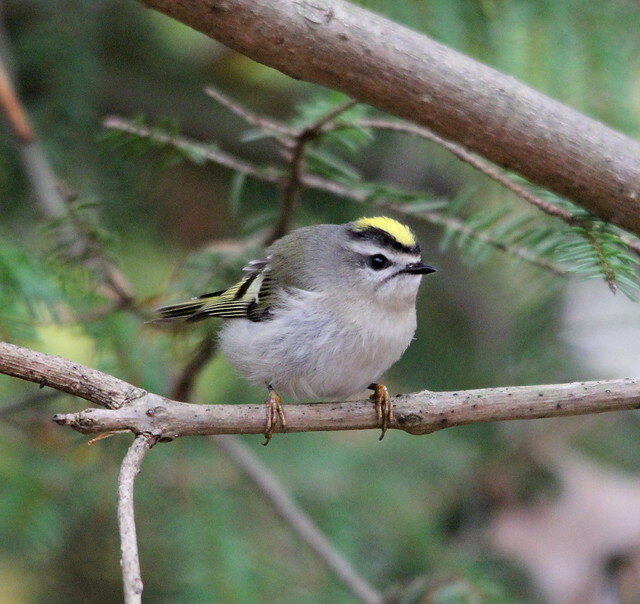 The Golden-crowned Kinglet, to whom these sounds belong, is nothing short of an avian miracle. These diminutive birds, whose average body size is barely bigger than the top half of your thumb, somehow manage to find enough food in temperatures as low as -40° to sustain their exceedingly hyperactive lifestyle, day after day after day. They survive each day against a set of overwhelming odds that works constantly against them, for a body that small, unaided, in the middle of winter, would die in a matter of not minutes but seconds at such cold temperatures. Their metabolism is so high that they must eat more than their body weight in food every day. And that's assuming that their diet is as rich in protein as it is during the rest of the year. Surely that is impossible given the lack of insect life in the middle of winter. And what of the nights? How would such a tiny creature stay warm without constant sustenance through the long hours of a cold winter's night? Their secret to survival lies in the tiny "inchworm" caterpillars of Noctuid moths—mostly those of the One-spotted Variant (Hypagyrtis unipunctata). They lay perfectly camouflaged against the twigs and branches of maple and birch trees all winter long, no matter how low the temperature drops. The caterpillars themselves are truly phenomenal. Just before their host trees shed their leaves, they stop feeding and, with a few strands of silk, loosely fasten themselves the outer tip of a branch. Now their bodies go through a chemical change that saturates their body fluids with high concentrations of glucose sugar, to be used as an antifreeze in the winter months. After a number of weeks, the substance has permeated each caterpillar's every cell. Packed with antifreeze, they are now equipped to survive even the coldest temperatures that the coming winter has to offer. The very same glucose that allows a caterpillar to survive the winter simultaneously provides an energy-packed meal for a kinglet. Thus, the kinglets' "hyperactive" behavior of hovering or hanging at the ends of branches, picking off seemingly invisible prey. 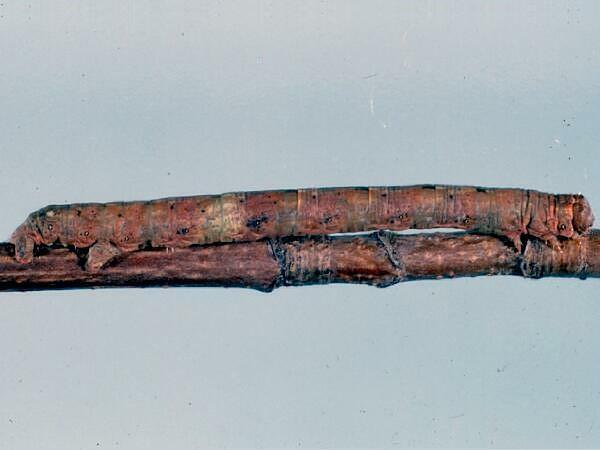 Another common winter feeding behavior coincides with the range of the Sack-bearer Moths (Family Mimallonidae). In August, the larvae of Sack-bearer moths construct open-ended sacks of silk and leaves where they will overwinter and pupate in the spring. They also ensure that their shelters will not fall off of the tree with the rest of the leaves by enforcing the leaf stems with countless strands of silk. 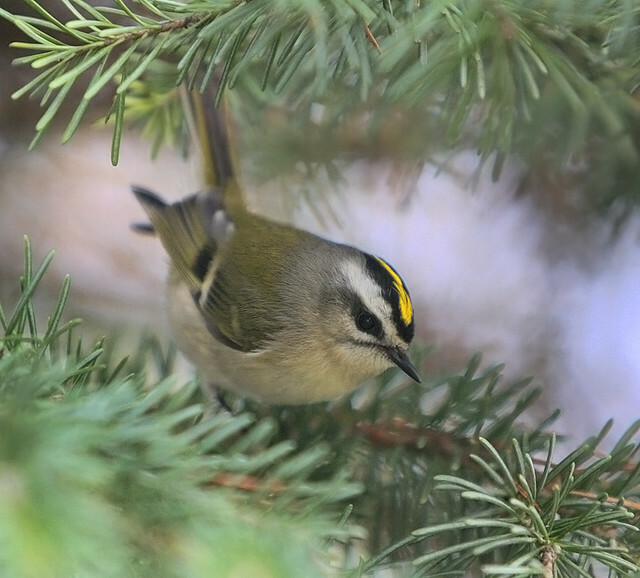 In the winter, flocks of chickadees and kinglets take advantage of this by locating these surprisingly inconspicuous clumps of leaves and poking their heads inside to make a meal of the luckless caterpillars. After a day of foraging, the members of each small flock find their way back to the dense conifer whose interior they have been roosting in at night since the first night that the temperature dipped below freezing. Once there, they may settle down close to the trunk of their tree and cuddle close together to form a fluffy ball of feathers. (One morning last winter, I was lucky enough to find one of these clusters roosting in the pine tree in my own backyard!) More often, perhaps, the flock returns to settle into a carefully constructed, globular, down-lined nest. Constructed by the flock during mid to late October, this structure is used solely as a roosting shelter on long winter nights. This apparently gives the Golden-crowned Kinglet the distinction of being the only North American bird to deliberately construct a nest for purposes other than incubating and raising young. Bernd Heinrich's sketch of a kinglet cluster. So, next time you see a Golden-crowned Kinglet on a cold winter's day, perhaps you can stop to ponder the miracle of the winter kinglet. Think of the staggering odds that the bird has beaten each and every day that the temperature has dipped below zero. Remember that you are witness to an incredibly unlikely scene: a tiny bird flitting about in lively manner in a frigid, hostile environment. For an excellent read and more information on nature's ingenious winter survival strategies, see Winter World by Bernd Heinrich.